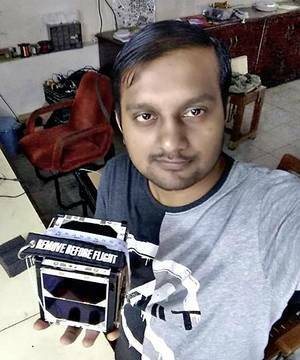 The Hindu newspaper interviews radio amateur Gurudatta Panda VU3GDP about the ExseedSat CubeSat built by an eight-person team at the Hyderabad-based Exseed Space Private Limited that was co-founded by Ashhar Farhan VU2ESE. ExseedSat carries an amateur radio FM transponder and APRS digipeater and is expected to be launched by SpaceX towards the end of 2018. “This satellite will serve the ham or the amateur radio community. As a result, it will be of great help during natural calamities, when conventional communication services get disrupted,” Gurudatta Panda VU3GDP said. After the launch, this artificial satellite will be on a polar orbit with two passes over India everyday. The public will be able to receive this artificial satellite’s beacon on 145.900 MHz FM using a TV tuner and USB dongle, Mr. Panda added. He said the eight-member team involved in construction of the small private satellite involved four technocrats and four managerial staff members. He and Exseed Space co-founder Ashhar Farhan VU2ESE were the communication engineers who played a key role in building the satellite.